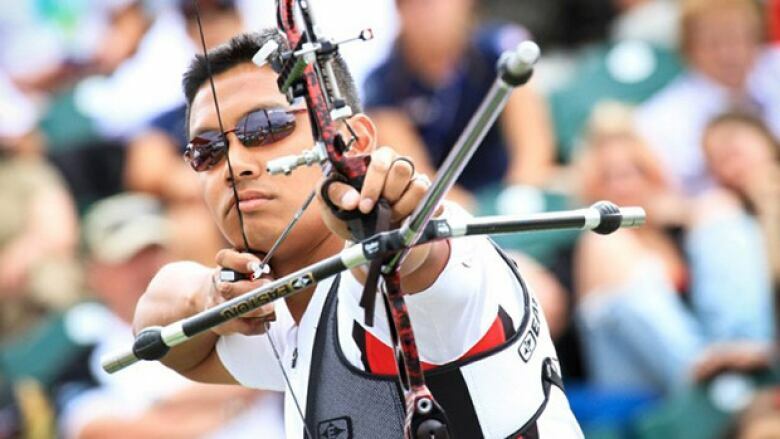 Six archers will represent Canada at the upcoming 2015 Pan Am Games in Toronto, Archery Canada announced Tuesday. The Canadian team includes two-time Olympian Crispin Duenas, of Scarborough, Ont., and 2008 Beijing Olympian Jay Lyon, from Winnipeg. Duenas is a two-time Pan Am Games medallist, having won silver in the team event at Rio in 2007, and then a second silver medal in the individual event at the 2011 Guadalajara event. In 2013, he became the first Canadian to win a world championship individual recurve medal in 42 years. "Our team has been training hard to ensure that we perform at our A-game here in Toronto," said Duenas. "Canada has some outstanding archery talent and it is a dream come true for us to represent our country on home soil." The squad is rounded out by Montrealers Patrick Rivest-Bunster and Georcy-Stéphanie Thiffeault Picard, Virginie Chénier, of Laval, Que, along with Kateri Vrakking, of Etobicoke, Ont. At 42, Vrakking was initially left off the team in favour of a 19-year-old archer who qualified two spots lower than the Etobicoke, Ont., native. Claiming "ageism," Archery Canada eventually reversed its decision.